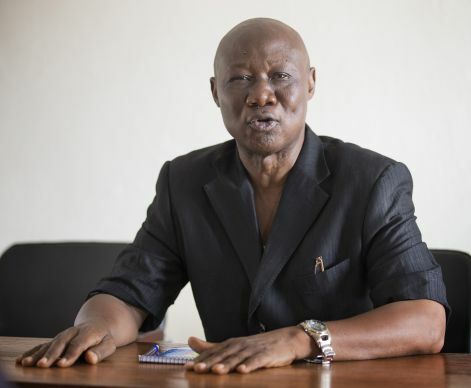 Dr. Alhaji S.Turay tells health workers that “Sierra Leone is swimming in malaria," during a check in-meeting at the Endemic Disease Control Unit for the Bo District in Sierra Leone. “Sierra Leone is swimming in malaria. There is not a single corner that is not affected,” said Dr. Alhaji S. Turay, medical officer for the Bo District. That disturbing fact is about to change, he said. Turay was addressing leaders who will be spearheading a distribution of more than 350,000 insecticide-treated mosquito nets in the Bo district. The leaders were gathered for a check-in meeting just days before the campaign’s formal kickoff June 5. Malaria is especially dangerous for children under 5 and pregnant and lactating women, Turay said. “The United Methodist Church has been working hand in glove to make this a success,” he said. United Methodists have raised $60 million in gifts and pledges for fighting malaria. As part of that effort, the Imagine No Malaria initiative has funded the purchase of the long-lasting insecticide-treated bed nets in the Bo district of Sierra Leone for the June 5-14 campaign. Using methodology forged by Nets for Life, volunteers have been going from house to house, registering and counting the people in the 15 chiefdoms of Bo. Families will receive up to three nets in homes with more than five; smaller households will receive one or two depending on the need. More than 100,000 households will be able to redeem vouchers for nets at more than 600 locations close to their homes. Including the supervisors and people stationed at the centers, more than 2,000 volunteers are ready to hand out the nets as well as vitamins and de-worming medicine to all children under 5 years old. After the initial nets distribution, volunteers will return to each household to make sure the nets are hanging in place above the sleeping quarters. Chiefs in the chiefdoms have pledged to note in their bylaws that the nets can only be used for sleeping. During “Hang Up,” the weeks following the distribution, volunteers will return to the neighborhoods with nails, hammers and ropes. They know from the experience of Nets for Life that many families can’t hang the nets because they don’t have the right tools. “The methodology is tried and tested,” said Priscilla Amuah, a Nets for Life representative at the June 3 meeting. Turay said nonprofit organizations, such as the United Methodist Committee on Relief, traditional community and church leaders, and the government of Sierra Leone are invested in making this work. By the end of 2014, Turay expects Bo to be well on its way to being malaria-free. “No more swimming in malaria,” he said, smiling.